EPBOT: More Resin Rose Petals: Final Batch & Give-Away! More Resin Rose Petals: Final Batch & Give-Away! I used larger chain links (harvested off an old necklace) glued directly to the backs of the resin as hefty hanging loops, and smaller O-rings for the connections everywhere else. 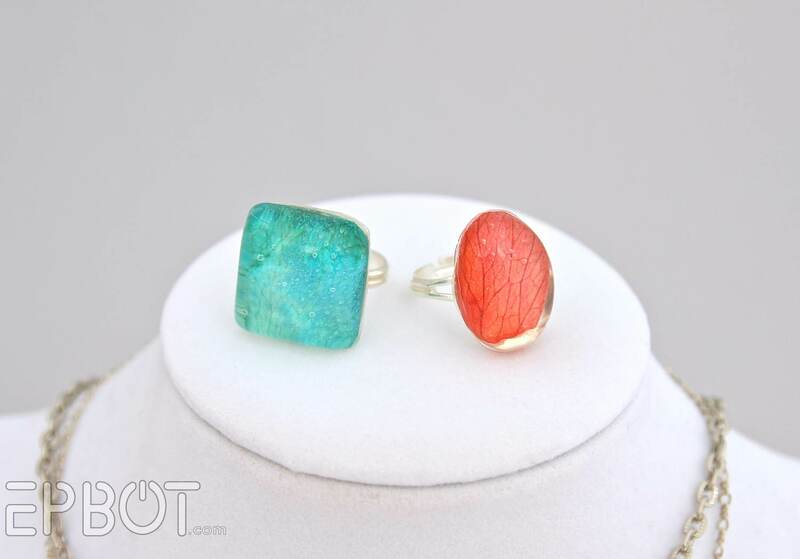 For this teal-and-coral set I also made another adjustable ring, since the teals matched. The pink petal is curled at the bottom, but honestly, that imperfection makes me like it even more! It was incredibly easy to put together, though, since the E-6000 I used gives you plenty of open time to adjust the rings and make sure they're even on all sides. I did learn one thing the hard way: if you put your hanging loops on the side of a gem, make sure they're at the top of each side, not the middle. 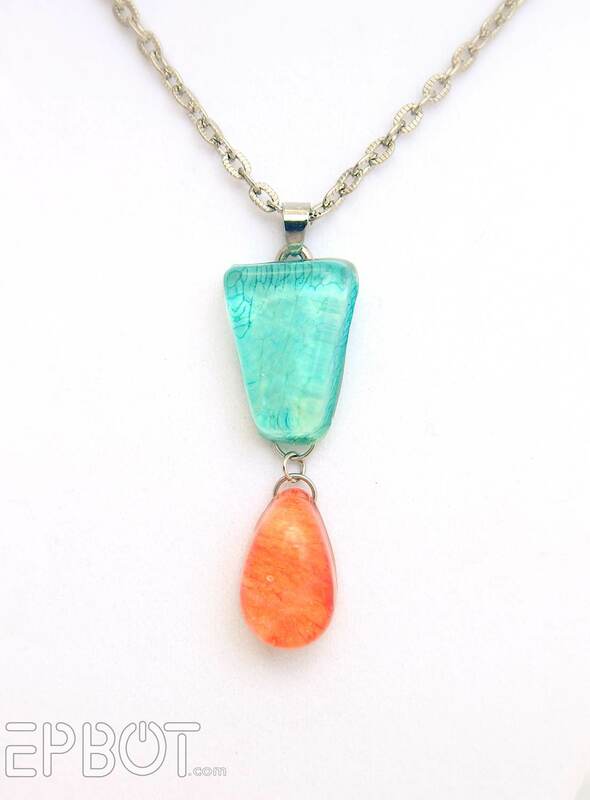 Otherwise your pendant will be top-heavy and flop over while you're wearing it. The good news is you can peel the E-6000 off your resin even after it dries, so re-setting the loops wasn't a problem. Then again, that could also be BAD news, since obviously you don't want your glue peeling off in the future! Still, it took enough effort that I'm not too worried; you'd have to really yank to risk breaking off a gem. And finally, the dragonfly necklace! Mega thanks to all of you who weighed in on the placement; the decision was almost unanimous, so that made it extra easy on me! UPDATE: The give-away has ended, and the winner is bmuir322! Congrats, bmuir, and please e-mail me your mailing address! Dang how I wish I was crafty. I love all of these pieces so much! I wish I had the rainbow petals to try to make my own. I'm drooling over the peachy pink set. LOVE IT! Oooh I love all of these! Totally wish I was organised enough to be crafty! Love them! resin hates me (either i didnt realize it was old and everything turns orange, or i dont mix exactly right and it never cures hard) so I rarely play with it, but these are so cool, makes me want to bust out the supplies again! Nice work! hooray! These are all just lovely. I am so glad you went with the left position. It is so pretty! 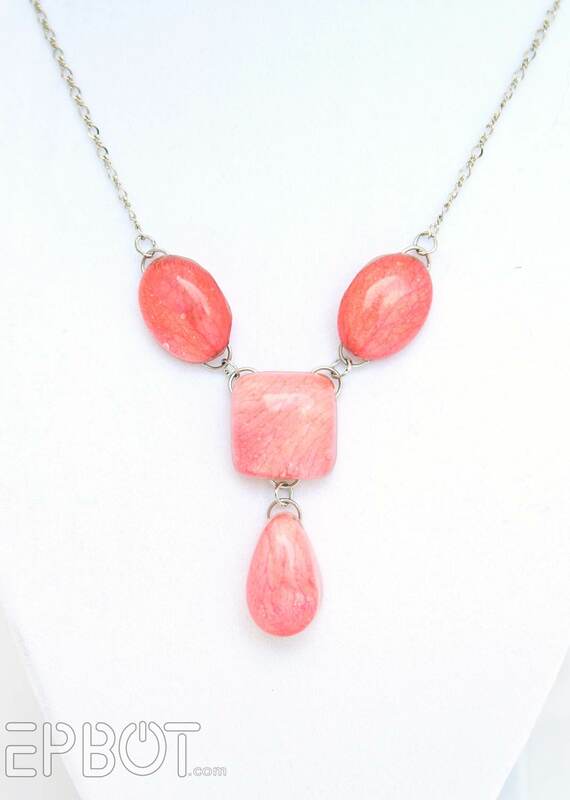 And the pink necklace might be my favorite one that you made! Oh my! I love these! I've been hesitant to get into resin work, mostly cause I really don't need another hobby right now, but I may have to give in! I recently started a fundraising site for adoptive families, and we auction off some stuff like that all the time! I'm not much of a jewellery person myself, but I know some people who would lo-o-o-o-ove that necklace! I love all of these, but especially the dragonfly! You're giving the dragonfly necklace away? But it's gorgeous, I'd have a hard time giving it away. Love it! Please, put my name in your magic hat for a chance! I really love it, perfect for spring and summer! I would LOVE to have that to wear! The pink stones are gorgeous (as are the rest)! Can you do a tutorial on how to make the gems? I love these!! So clever and so pretty! So, I've been reading your blog for a long time (it's my fav! ), and I have to say, I think this is one of my favorite crafty things you've done EVER! I really love the colours in all of these. They look like candy! I absolutely love the dragonfly necklace. They are all beautiful but the dragonfly gives it an extra something that makes it completely gorgeous! These are so beautiful!! Love, love, LOVE!!! I love these! 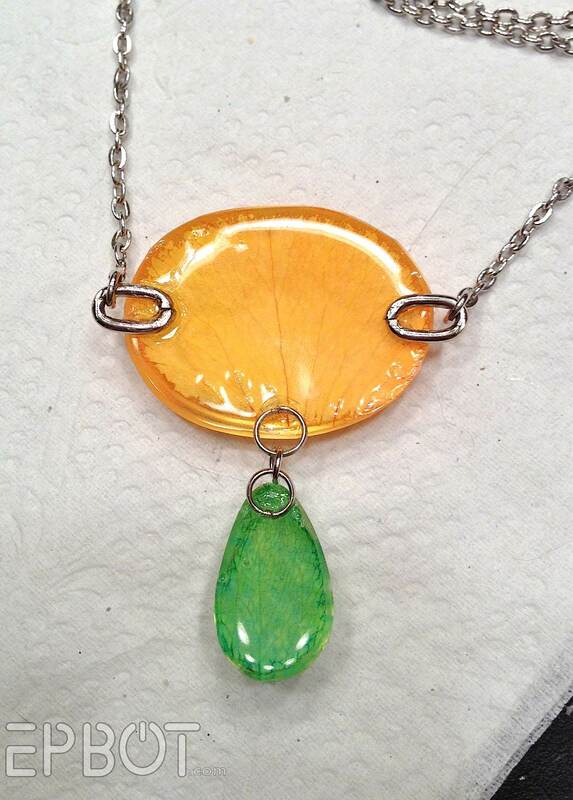 Your friend did an amazing job creating these petal pendants! And I love, love the dragonfly pendant! Love the placement also. Oh, these are just beautiful!!! Well done Jen!!!! Stunning. Fabulous. And, I have a dress that needs that necklace. I try to be crafty, you make it seem so easy, but I am all thumbs when it comes to artistic endeavors. Love all your posts, carry on. Love these gorgeous pieces... makes me wish I had the time to re-start my chainmaille jewelry hobby. Babies get in the way of stuff like that ;) LOL. I love these! They totally make me want to tackle the resin project that's been poking at my brain for months. Yay for inspiration! I envy your craft ability. These are gorgeous! Seriously lovely. I never thought to reuse roses like this and now I don't have to be sad throwing away my dusty dried ones! I LOVE the dragonfly piece. I think the placement is perfect. They're all so beautiful (and my friends would be SO jealous of that dragonfly necklace!)!!! Thank you for showing us all these options. I wish my discards looked as great as Renee's. Your creativity keeps me coming back every day to see what is new. Bea on daughter Anna's log in. Please pick me! I was SO hoping there was some sort of give away coming when you made the last post and showed all the beautiful jewelry! Gorgeous! I need more fun jewelry to get me into wearing it...and now I really want some rainbow roses!! I would LOVE to wear this necklace and brag to everyone that my bestie, I mean, a fabulous blog gave it to me. I love these! You have convinced me to try to make my own at some point. 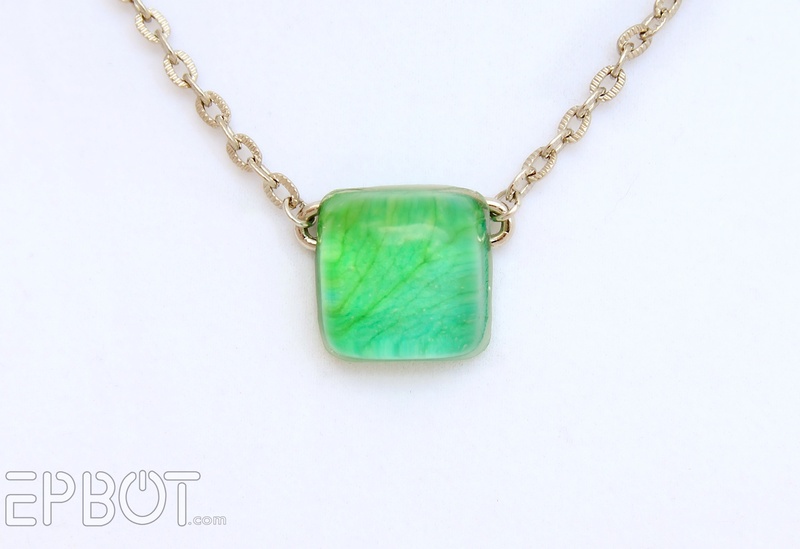 I love the touch of nature to these pieces - makes such a change to the alternatives! 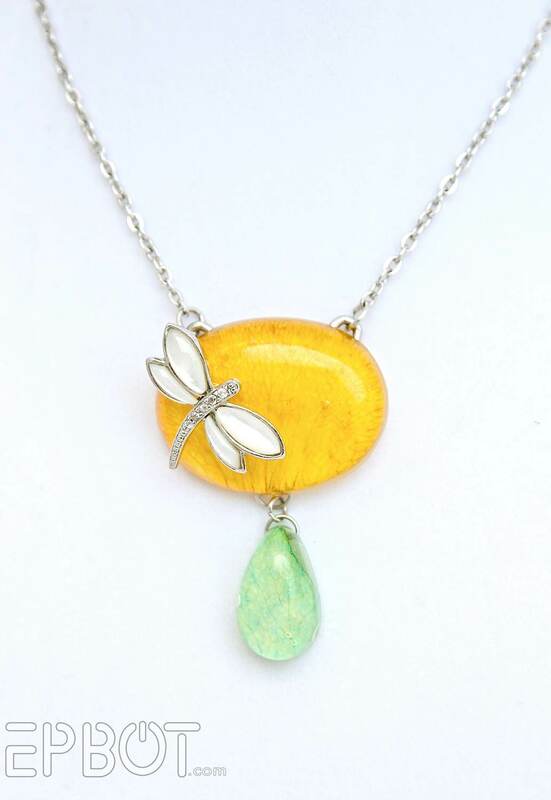 The entomologist in me loves the dragonfly, and regardless of whether I'll wear it it would certainly be well suited to my home! You clearly had lots of fun with these! They look great! Posts like these always make me want to get out there and do something creative! Which is good, except I don't really have a project in mind yet so... to pinterest! Oh, it's so beautiful! I have no idea how you can bear to part with such a pretty thing, but thank0you for the chance to win it! 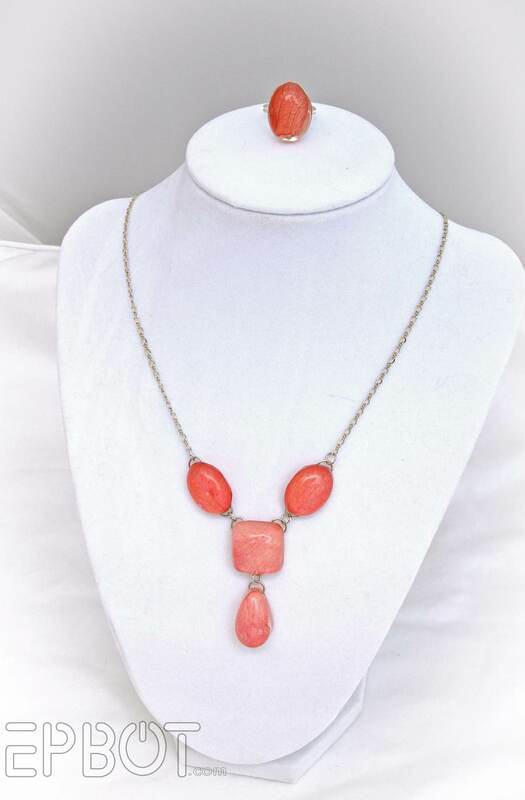 Who knew rose petals would make such beautiful jewelry? I'm sure the person creating them had something to do with it too, though! So pretty! I want to play with resin now! Those resin gems are beautiful! I love all of the pieces you've made with them. I agree with all who voted for the placement of the dragonfly, it looks perfect! I'm feeling very inspired to go try my hand with resin now! Nice work, Jen. You have made some beautiful pieces here! Ooh! A giveaway! Those rose petal jewels are so beautiful. I really need to get into doing more resin jewelry. I have all the resin and stuff, I just need to make things! Ooooh I am so commenting on this one, love me some dragonfly goodness! I really love how you've put together these pieces! They are really pretty! So beautiful! I'll have to play with some of these ideas. The colors are so bright and warm! Those are lovely! I especially love the dragonfly color combo. Never tired resin before and now I want to! I love dragonflies! These are all so beautiful! Gorgeous gems! I think this concept is amazing! I'm inspired! These are beautiful. Those are lovely! I may have missed this, but how big are the gems? I love how the resin magnifies the veins of the rose petals. So pretty! And I love how bright the colours are. Oooh, I bet this will come in VERY handy in the future. Thanks, Jennifer! Super gorgeous stuff! I love what people can come up with using something so simple! I am not a jewelry person, but holy goodness these pieces are just incredible. Just gorgeous. I love the dragonfly so much! So understated, yet breathtaking. To both of you, amazing, amazing work. i commented and now i can't find it... anyway, the necklace is quite stunning really. i love it! That dragonfly necklace is so cute! Love it! It's making me want to save petals from my roses and try it. They are all so gorgeous! I love how bright the colors are. Love it! I always had a soft spot for dragonflies. Oh my gosh you're giving away the dragonfly?!?!?!? I adore dragonflies! Ooooh *crosses fingers* And seriously, these are all amazing, I can't believe there were all considered rejects. You did some amazing things with them, they are GORGEOUS! They are all so gorgeous! I especially like the square green one. I'm definitely gonna have to try to do this! I would love to try making these... add it to my never-ending craft to-do list:-) I wonder if it would work with dried petals, since I have my wedding bouquet dried. The dragonfly is awesome! According to Renee, it's actually BETTER with dried petals, since the colors are more vivid. So you're in luck! I love how the dragonfly turned out and all the other pieces too! So very, very pretty! I'm thinking I might have to look into this (not that I need another craft project, but oh well! I love how they all look. Very cool. I need more yellow in my life. That is really stunning. So I hit this post first and am in total awe that these came from rose petals. THEN I read the original post... and after I recovered from my slack-jawed, bug-eyed state, all I could think to say was, "Wow." If your friend ever decided to set up an Etsy shop, my gods, I'd be all over it! You are so crafty! It makes me want to look at all the broken jewelry I have held onto and see what I can do! Are you sending a finished set back to your friend Renee? 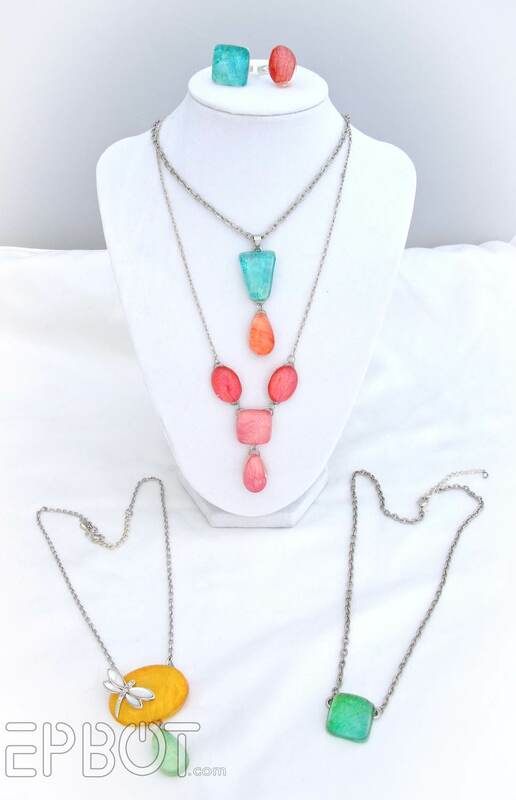 I imagine she wouldn't say no to these gorgeous pieces! Renee, nothing to see here! I love that dragonfly necklace! I love all things dragonfly. That necklace is absolutely beautiful! All of these projects turned out so lovely! Thanks for teaching, and sharing! What am I looking at? The display bust or the jewelry? OMG this is gorgeous! My husband won't let me keep E600 in the house with the baby around, I need to keep this saved! What an awesome necklace! You are so creative! Since I'm not likely to actually make anything so gorgeous, I would love to win it. Love them! And I'm super picky about my jewelry! 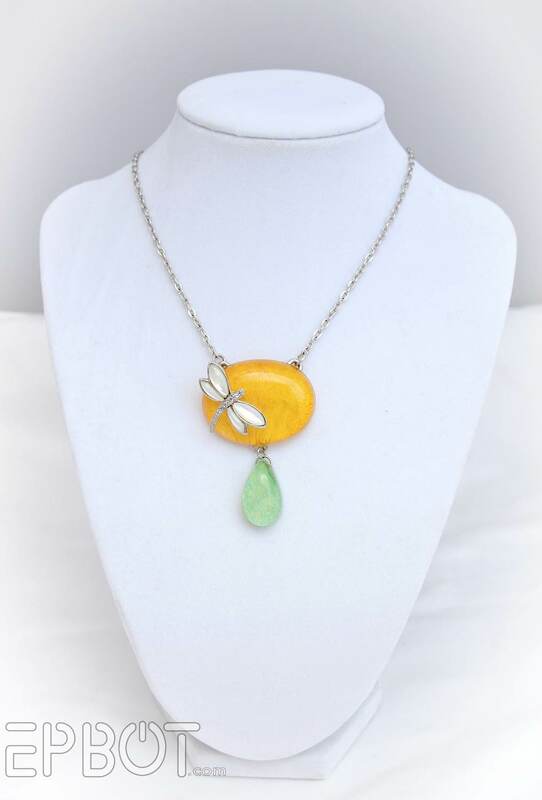 If I won that beautiful dragonfly necklace I would send it to my friend, who tragically lost her 17 year old son last month in a car accident. Dragonflies remind her of him. So pretty! And dragonflies have been a thing for me the past couple of years. You always do good work, but this piece looks like something I'd enjoy wearing. Placement turned out wonderful and seeing all the jewelry makes me want to find some of those roses! These are so beautiful that they're almost making me want to be more adventurous with my crafting attempts. Almost. :) I especially love all the vibrant and cheery colours. Amazing. Would love to win one of your creations! Thanks for the giveaway! Those are all amazing but that dragonfly is just stunning! All of these are so pretty! These are amazing! I just might try making some myself. I love these tutorials, I am always inspired to try something new. You are amazing Jen! I would love to win this! I did not need another hobby! Must. . . obtain. . . petals! Love all the jewelry! Guess I have to add another thing to try! I love dragonflies. They're my favorite, and all this jewelry looks amazing! I never win anything but am giving this a shot! They are all fabulous!! I am in awe of people of figure out how to do things like set rose petals in resin!! So gorgeous! I love the placement! Wow, those are great. The dragonfly turned out cute. it's lovely! they all are, really. The dragonfly necklace turned out amazing! I wasn't sure how it would look since I thought having the dragonfly on the right side would look better. I can admit I was wrong. So pretty and wonderful summer colours! Love it! Also, saw a shirt with a hot air balloon pattern while shopping today and it made me think of you! I swear, every week you do something new that I want to try. You are so sweet to share the goodness in this giveaway! Beautiful! since I'm not sure if my first comment posted, this is absolutely beautiful!! So pretty! The next time I get flowers I'm going to have to try my hand at resin. Such vivid color and amazing detail. The pieces are sooo pretty and well done! I have not used resin other than doing paint sample analysis for work. But now I want to try different types of materials with it. I would love to have this gorgeous dragonfly necklace, Jen! Thanks so much for sharing your wonderful projects with us! Gosh those are lovely! And the dragonfly, wow! I'd like to see maps and bits of books instead of rose petals too. Fun! I wish I had the gumption to try the resin. It's so summery and fun! I love it! I love them!! the bright colors are so pretty! These are so awesome! I would buy them! Love! I've made some resin jewelry with small gears and locking nuts (which look like little gears, yay hardware store jewelry). Using the rose petals is lovely. I love all this! I wish I knew how to use resin. I have the most beautiful pinkish-peach roses growing outside my living room window, and I enjoy them so much when they are in bloom. I'd love to make some of these gems and have them to look at year-round! I think the two of you could rule the crafting world. I always love coming to your blog to see all the thing you and the amazing people you feature are doing. I briefly used to work with resin and I loved it. I may have to get back into it! The dragonfly necklace is lovely! It's all so lovely! I had never heard of rainbow roses before this, either! How do they DO it? I love the dragonfly necklace! And I'm so glad you went with the side placement. So very gorgeous! Now I want to buy all kinds of flowers and put everything in resin! 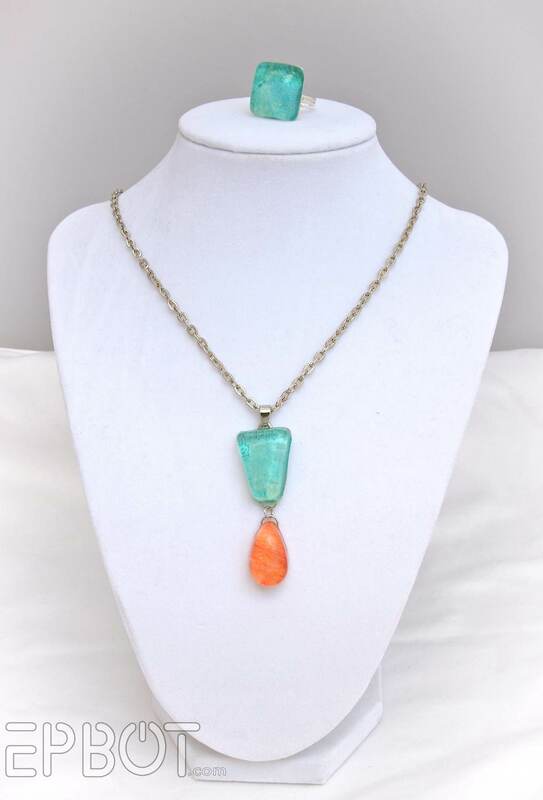 You picked my favorite placement of the three, and my sister would absolutely love this necklace! Oh my goodness I wish I was half this creative! Love it! Those are amazing! and super creative. I kind of want to experiment with resin and rose petals now too! FanFREAKINtastic! You're inspiring me to pull out my old jewelry components and get to play. The dragonfly necklace is great! I can't believe you're giving it away. I'm crossing my fingers that I win! ... and secretly making a shopping list of items I'll need to try it myself in case I don't. The Best Tweets & Pics Of SDCC! DIY Inspiration: Rainbow Rose Petal Jewelry! Glass Heads, Skull Lamps, and CATBUS!! Metal Effects Experiments: Add Rust To Anything! Miami Supercon 2014, Part 2! Curse of the Death Eater?